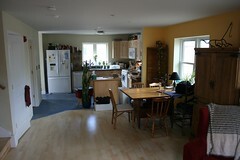 Cohousing | Planet Geek test site. Sounds more grandiose than it is, really. We’re going through a heck of a heat wave here on the east coast. The last 2-3 days have been 90+ degrees with high humidity, and it’s showing no signs of really letting up until at least next week. I don’t react well to heat – I mean, I can deal with it during the day while puttering around, but sleeping? Bad things happen when Mr. Geek doesn’t get his beauty sleep. With our super efficient buildings, we really don’t need to air condition an entire building just to make it habitable. But I’ve found that even with proper ‘behaviour’ (closing windows during the day, opening at night, using fans if necessary), I still need to cool the space down when I sleep. Here’s how I set up my bedroom to use the minimal amount of cooling necessary for me to get a good nights sleep. So last night I moved the room AC under the loft, turned it on LOW, and dangled one of my sheets over the end of the loft. With that loose enclosure, the low-power AC was easily enough to keep the space cool. I flopped on what is normally Zach’s bed, and slept like the dead for almost 8 hours. I’m able to cool that space down in about a half an hour. I can turn off the AC when I leave, so in the end, I run the AC only about 9 hours a day on lower power. Just enough for me to get a good nights sleep. Categories : Cohousing, Geekitude, Life. Don't talk to me about life. Ahh, it’s wonderful stepping out on my porch in the morning, sitting down with my coffee, and viewing the awesome vista laid out before me… and my laptop. The nifty thing about this is some of these WAPs are in Camelot, about a hundred yards north. 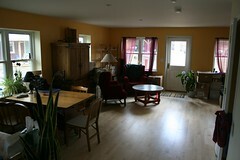 Categories : Cohousing, Life. Don't talk to me about life. Come join us for a May tour of 4 cohousing communities on Saturday, May 16th, led by Laura Fitch, a cohousing architect and 15-year resident of Pioneer Valley Cohousing in Amherst. We will travel by bus and visit Camelot Cohousing and Mosaic Commons, 2 recently completed projects in Berlin, MA, then move on to tour New View in Acton and finish up at Jamaica Plain Cohousing. The tour meets and ends at the Riverside MBTA station (on the Green Line and just off Route 128 in Newton). You will have a chance to see 2 active cohousing communities and 2 which have just been completed, and visit with members of each. A fact sheet about each community will be provided and plans are in the making to have lunch at one of the just-completed communities in Berlin! Cohousing Day #28 – Superinsulation Works! Today we had 2 more houses move in (well, technically, only one – since the second is still unloading items from the truck as I type, and it’s 9:30 at night.) Tomorrow we have another household moving in, bringing our grand total to 7 so far. That’s seven families that have pulled up everything, and moved here. And there’s more to come. But that’s not what I came here to talk to you about. When we designed our houses, we put great emphasis on Superinsulation. The idea that a house should be insulated far beyond what ‘code’ calls for, to the point that it can stay warm in the winter and cool in the summer with a minimal amount of work by heating / cooling systems. Today we were able to put that to the test. 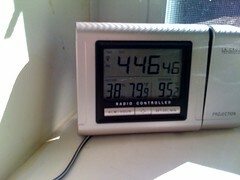 It got incredibly hot today – hot for April in New England, topping out at around 95 degrees according to my indoor/outdoor thermometer (see above). (Note that wunderground history for today says it only got up to 89. But it was still damned hot). According to the thermometer, it got up to 95 outside, but stayed at or below 79 inside the house. Note that we have no fans running, no AC, in fact all the windows were closed. The house kept in the cool air from the night before – all day long. Even with traffic in and out. That, my friends, is energy efficiency. How many other people turned on air conditioners today? We didn’t have to. Cohousing day #20 – Spontaneous Outdoor Meal! Tonight we had one of those cohousing moments everyone talks about, but this really was experienced first hand. Diana made tasty tacos while I got out the furniture and set things up. Cat finished up the work she was doing on the house, and the 3 adults and 4 kids sat down for a lovely outdoor dinner. We had a visit from the fellow doing work on Beezys house, and our soon to be neighbor Ken came by as well. Later after we had finished and were lazing around chatting, Kai came by and shared some quiet time as well. All in all, a nice end to the week, and we got to use a common house resource for something shared and pleasant. This morning we closed. We are once again homeowners.